A type of blood sausage, black pudding is at once a staple British product, worthy of its place in any full English breakfast, and a controversial ingredient in the same way that offal and sweetbreads are. Our exciting black pudding recipe collection explores the many ways it can be used as an ingredient, element, or focal point of any dish. 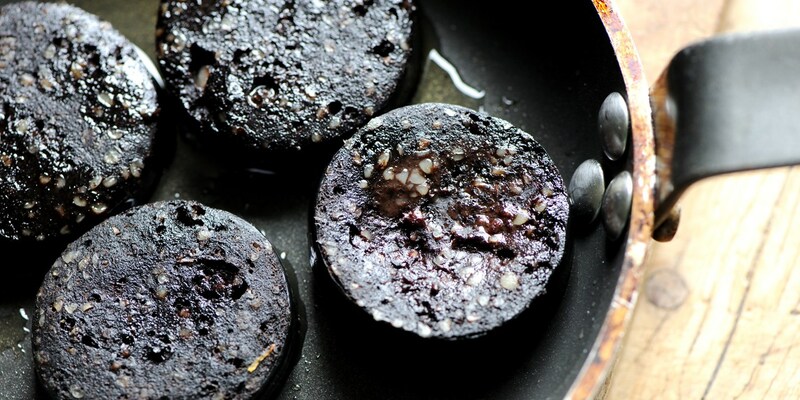 Black pudding is normally made of a mixture of pig’s blood with oatmeal, pork fat, onions and plenty of spices and seasonings, giving it a strong and robust flavour. Bryan Webb’s meaty pork four ways recipe celebrates black pudding alongside pork belly, trotters and tenderloin, while Matthew Tomkinson pairs with chicken in a terrine for a greater contrast of flavours. We also have recipes that hark back to black pudding’s Scottish heritage, such as Nigel Mendham’s venison and black pudding Scotch egg, which makes a deliciously unusual starter.